When people describe a watch you often hear phrases like "Adjusted", "Adjusted to 5 Positions" or "Unadjusted". What these phrases mean can be quite confusing to a new watch collector. This webpage tries to help clear up some of this confusion. What does it mean for a watch to be "Adjusted"? What kinds of adjustments are there? What does just "adjusted" or "6 adjustments" mean? This notation was not used internally by Elgin, they used Adjustment Numbers instead. The short answer is that "adjusted" may mean nothing at all. In reality, the ability of the watch to keep time is the important thing. Even the cheapest watch was expected to keep reasonable time and a few quality control checks would make sure that it did. A high grade watch may have been a perfect time keeper when it left the factory, but it only takes dropping the watch once, one rusted part, or one trip to a bad watchmaker to make a watch run poorly. Any antique watch has had plenty of chances for these things to happen. The claims of being "adjusted" (or not) is really a matter of degree rather than a black and white statement. A watch company that claims a watch is adjusted, but actually performs poorly will quickly lose respect. Adjustments are mostly matters of quality control, of sticking to strict tolerances, and of building it right the first time. A skilled watchmaker can take an unadjusted watch and, with enough time and effort, make adjustments so that it keeps excellent time. On the other hand, a skilled watchmaker can also take a block of brass and, with enough time and effort, make a watch out of it that keeps excellent time. In general, it will take a lot less effort to make an "adjusted" watch keep good time because the watch was made right to begin with. Railroad watches were generally required to keep time to within 30 seconds per week under actual use. So, watches marked and approved for railroad use had real requirements to back them up. For many years, the Swiss had specific requirements before a watch could be marked as a "chronometer", so these too, had real requirements to back them up. Adjusting a watch is not like adjusting a car seat. There aren't a bunch of dials, screws, or levers that can be moved to correct things. There is usually a single "fast/slow" regulator lever, but that just changes the overall speed of the watch. The regulator won't make a watch run more consistently from day to day, it doesn't change how the watch keeps time at different temperatures, nor how well it keeps time when it is being bounced around as you walk. There are 9 qualities of a watch that can be brought into adjustment. They are temperature (both heat and cold), isochronism (the ability to keep the same time when fully wound as when it is wound down) and the 6 positions that the faces of a cube can be in. As mentioned above, even an "unadjusted" watch is expect to keep reasonable time and there are no standards for what can be marked "adjusted". While Elgin's marketing side of watch production made heavy use of the adjustment terms, an internal Elgin document shows how, in the production side, all watches were required to meet certain standards. For watches marked "Adjusted", these standards were higher, and even though the highest grade watches were marked the same way, some had even higher standards still. The tolerances could be as small as a couple of seconds a day to almost a minute per day. If a watch consistently gains 33.7 seconds per day, every day, then it is usually fairly easy to make the watch keep time to within a second or two per day. However, it is very hard to make watches run consistently for two reasons. First, watches are worn differently each day. Secondly, a watch is what is known mathematically as a "driven-damped system" which has now been proven to be inherently chaotic. Any inconsistency in a watch exponentially amplifies this chaos. The Adjustment Number table implies that all Elgin watches were adjusted to at least two positions, although the tolerances were sometimes very large. Most Elgin watches were designed to correct for temperature changes, although most were not actually checked to see how well they succeeded. Most of the higher grade watches were designed to be isochronic with an "overcoil hairspring", but even the lowest quality Elgins did fairly well because they have a standard lever escapement. Changes in temperature effect the watch in two ways. First, it will make the balance wheel expand or contract, which changes the moment of inertia, which in turn, changes the speed that it swings back and forth. With 86400 seconds in a day, it really doesn't take a very large change in the size of the balance wheel to make a watch run noticeably fast or slow. 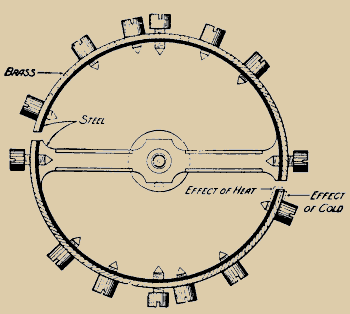 The second, and actually the more significant effect of temperature is on the hairspring connected to the balance. The colder the watch gets, the stiffer the hairspring gets and the quicker the watch runs. The two temperature adjustments require either a "bi-metallic split balance wheel", or materials that don't change with temperature such as "invar" and "elinvar". Both techniques require the watch to be designed and built with temperature adjustment in mind. Generally, a watch maker will not check the temperature adjustments, and in the case of using special metals, there is nothing they could do to change it anyway. A split balance wheel is made with an outer ring of brass and an inner ring of steel. The brass changes size more quickly than the steel, so when the temperature drops, it causes the halves of the ring to straighten out and to actually expand the ring a little bit. This compensates for the otherwise normal shrinking of the balance and the change in the hairspring stiffness. Just having a split balance isn't enough, however, to make the watch fully temperature compensated, you also have correctly place the timing screws. This is done by timing the watch in an ice box (around 30°-32° F) and also in a hot box (around 90°-100°). Over time, Elgin developed tables that they could use to quickly find the correct locations of the timing screws based on the errors at these two temperatures. Some watches are marked as being "temperature adjusted" to show that this adjustment has been made and checked. A split balance doesn't solve all temperature errors. In practice, changes in temperature don't cause the balance to change shape at just the right rate to fully compensate for changes in the stiffness of the hairspring. This leads to what is known as "middle temperature" errors. There are more complicated balance wheel designs that help eliminate these middle temperature errors, but they didn't prove to be useful enough to be worth their added cost. After around 1920, some special metal alloys were discovered and put into use that do not change with temperature. If you use these alloys, called "invar" and "elinvar", for the balance and the hairspring, you automatically have temperature adjustment. The invar metal doesn't change size (it is invariant) with temperature, so it is used for the balance wheel. The elinvar alloy doesn't change stiffness with temperature (it is elastically invariant), so it can be used for the hairspring. It is best when both of these alloys are used at the same time, but invar is sometimes used in place of steel in the bi-metallic split balances to reduce the middle temperature error. When a watch is held in different positions, gravity will cause the various parts in the watch to rest on different spots. If the friction isn't exactly the same in all those positions, then the watch will run at different rates. This is because the balance wheel will take more time to swing back and forth when it is making a wide arc than when it is making a narrow one. This is true even when a Breguet overcoil hairspring is used to try to increase the isocronism of the watch. While in theory there are infinitely many positions that a watch can be in, in practice there are only 6 different positions that generally show different results. Those 6 positions are the faces of a cube or die. The dial can be face up, the dial can be face down, the pendant can be pointing up, to the left, to the right or the pendant can be pointing down. Most of the time, pocket watches are either being carried and have their pendants up, or they are laying flat, with their dials up. Since pocket watches are rarely in the pendant down position, that position is generally not checked. Wrist watches, on the other hand, are often in the pendant down position when people are walking, so it is one of their primary positions. The watch must be cleaned and correctly oiled. Too much oil, as well as not enough oil or oil in the wrong spots can effect the performance in only some positions. The ends of the arbors must be smooth and correctly shaped. It is very hard to make the friction the same when the gear arbors (axles) are sitting on end as when they are lying flat. The balance wheel must be poised. That is, there can't be any heavy spots on the balance that would cause it to roll when placed on two level knife edges. The hairspring must be correctly centered so that it "breaths" evenly in all directions. Otherwise, the balance will come out of poise during its swing. The curb pins on the regulator must be adjusted so that the hairspring hits them when it is supposed to. Cracked jewels and jewels that are not seated correctly can cause problems. If there is too much side shake on the balance, fork or escape wheel, then the force transmitted to the balance will change. Larger and heavier forks need to be counter balanced so that they are at least somewhat in poise. By the 1920s, the forks became light enough that the extra inertia caused by these counter balances out-weighted their benefits to reducing positional errors. One of the hard parts about adjusting to positions is that a correction in one position may cause changes in the rate of other positions. For example, the hairspring will hang differently in different positions and therefore touch the index pins at different times. You sometimes see people describe a watch as being "adjusted to 8 positions". These people are being confusing the phrase "8 adjustments", see the section below. Isochronism, from Greek meaning "same time", is the ability of a watch to keep the same time when fully wound as when it is wound down. The problem is that when a spring is wound up, it will deliver more power than when it is almost unwound. So, when the mainspring is wound up, the balance wheel will get more energy every time it ticks causing it it to swing further. But if the balance is swinging further, then it is going to take more time to travel that distance, and therefore the watch will run slower. This problem with unequal force from the mainspring is somewhat corrected by having a hairspring. When the balance swings further, it is winding the hairspring up more, so the hairspring will keep the balance from swinging too much further. The hairspring then sends the balance back in the other direction with more force so, while the balance wheel will swing further, it will also be moving faster. This somewhat compensates for the longer travel distance. Creating an isochronic watch is done mostly by the design and manufacturing. 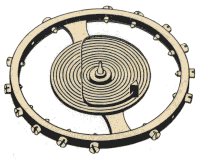 A fusee can be used to equalize the mainspring power, but it is bulky and expensive to make. A remontoire is another solution that involves having a small spring that is regularly rewound by the mainspring. Like a fusee, it is expensive to build. The type of escapement can also help. 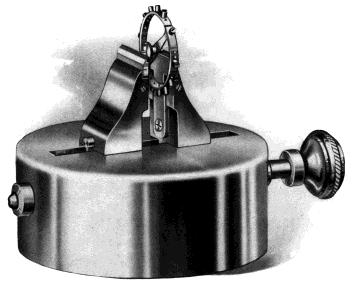 A lever escapement, used by most American watch companies, will be more isochronic than a verge escapement, commonly used before 1850. A long mainspring that, when wound daily, will only use the first part and will deliver a more uniform force. If a watch has a device called a "stop works" on the mainspring, then it can use the center portion of the mainspring which is even more uniform. The mainspring can be manufactured with a permanent bend in it that looks something like a big S or a treble clef. By having parts of the spring pre-bent in the direction it is wound up and other parts that are actually pre-bent in the opposite direction, you can create a mainspring that will deliver a much more uniform force throughout the the running of the watch. Well, permanent is probably an over statement. Over the years, the mainspring will "set" in the wound shape and will not deliver as much power or as uniform power as it did originally. A hairspring that has many turns will be more uniform, so most hairsprings have 12 to 15 coils. The hairspring can also be shaped in the form of a Breguet overcoil, which also helps. The point that the hairspring attaches to the balance can also make a difference. About the only thing a watchmaker can easily do to make a watch more isochronic is to adjust the shape of the hairspring and replace the the mainspring with one that isn't set. Modern mainsprings can be made much thinner, so it is possible to put a much longer mainspring in an antique watch. A modern mainspring will deliver much more uniform power, won't wind down as quickly, and probably will never break. In practice, no watch is really isochronic and it is not clear to me what watch manufacturers actually mean by claiming a watch has been "adjusted to isochronism". For the Online Elgin Database, the "x adjustments" is always translated into the AnP form. Until around 1910 or so Elgin, and most other American watch companies, just marked their movements as "adjusted", and did not list the number of positions. How many adjustments Elgin made varied by the grade of the watch. I think that watches marked "adjusted" were always at least A2P, but I'm not certain. Later on, when wrist watches became popular, there wasn't enough room to say things like "Adjusted to 5 Positions and Temperature", so Elgin (and others) went to marking the watches as just "Adj'd".